My friend Amy is full of gorgeous ideas. She frequently gets me into trouble sending me messages from Etsy and Ebay about things I absolutely MUST have. 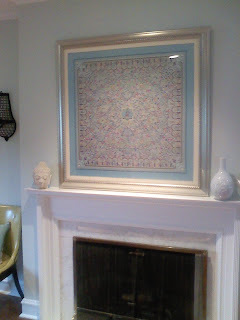 One of her more amazing suggestions has been to frame an Hermes silk scarf. Look at the gorgeous aqua border and the subtle palette. We share an obsession with all things aqua and turquoise.